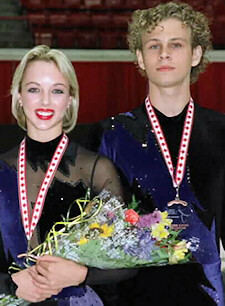 After winning the junior ice dance title at the 2003 U.S. National Figure Skating Championships, Morgan Matthews and Max Zavozin are one of the hopefuls for a podium finish at the 2003 World Junior Figure Skating Championships. After winning the junior dance title at the 2003 U.S. National Figure Skating Championships, Morgan Matthews and Max Zavozin are one of the hopefuls for a podium finish at the 2003 World Junior Figure Skating Championships in Ostrava in the Czech Republic. Matthews began skating when she was five. “My grandmother took me to Nutcracker on Ice, then I begged my mother to take me skating,” she said. “Then when we went to Poland, I saw ice dancing there and I liked it. My freestyle coach was a former ice dancer, so she got me started in ice dancing when I was eight.” Zavozin, on the other hand, was a late starter. Although he comes from a famous Russian skating family, he resisted the family tradition until he was 13. Matthews has competed in both dance and pairs. “I skated pairs before and had two pairs partners and a couple of dance partners,” she said. “I kept going back and forth, but the last time I went back to pairs was because I didn’t have good results in dance. My heart really was in dance. I love the choreography of dancing.” Her best pairs result was fifth at Nationals in novice with Val Rising-Moore in 1999. Zavozin competed with Stephanie Ellis, reaching 12th in novice dance in 2001, before partnering with Matthews. Matthews and Zavozin train in Sunrise, Florida, where they are coached by his mother, Elena Garanina, along with a second coach, Valeriy Spiridonov. They work for about four hours a day, five days a week on ice, plus another hour or so on Saturdays. Their off ice training includes about an hour a day, six days a week. They take ballet twice a week and power training three or four times a week. Both of the skaters have been home schooled. Matthews is a sophomore in high school, while Zavozin is in his second year of studies at Broward Community College, in a dual enrollment program with the high school. Both of the skaters plan to go to college. “Not right away, but later,” Matthews said. “It’s too early to tell what I’d study, but probably something related to the arts. The only special course I’m taking now is oceanography through the University of Chicago.” Zavozin expects to study business, while Matthews hasn’t decided yet. “I’d like to be a coach or a choreographer, probably a choreographer,” Matthews said. “I’ve taught some classes as a volunteer for Learn to Skate.” “I may be a coach. I’m still trying to decide what I want,” Zavozin said. Figure Skating pairs team Shen Xue and Hongbo Zhao became the first Chinese skaters in any discipline to win a gold medal at the Winter Olympic Games (2010). They won the bronze in both 2002 and 2006. They are also the first Chinese pair team in figure skating to win a World title (2002). They also took the World title in 2003 and 2007. More on Shen Xue and Hongbo Zhao from Golden Skate.